In a small scholarly town just a few miles from New Delhi, a private university is striving to revolutionize psychology’s identity in India. Ashoka University, a fledgling nonprofit institution located in the state of Haryana in northern India, has a mere three people in its psychology department faculty, but the university plans to hire additional instructors over the next few semesters. The program’s fundamental goal is to bring students a scientific perspective on psychology with quantitative methodological training. Ashoka, which began its undergraduate program 2 years ago with a class of 133 students, is the brainchild of several Indian industry leaders who worried that the nation’s higher-education institutions were overemphasizing professional skills over a strong foundation in liberal arts. That philosophy, which has won plaudits from such world leaders as former US Secretary of State Madeleine Albright, is also the impetus behind the university’s 1-year postgraduate Young India Fellowship (YIF). Ashoka’s psychology program launched last year under the leadership of APS Fellow Neil Lutsky, chair of the psychology department at Carleton College. Lutsky spent a semester at Ashoka and crafted the description of the school’s psychology major to emphasize the field’s scientific aspects. He also hired the program’s founding faculty. “Current estimates of the number of mental-health workers in the nation vary, with some estimating there may be as few as 0.5 clinical psychologists for every 1 million citizens,” Chan said. “Even among the already small pool of clinicians, many are not trained in evidence-based therapies. Ashoka’s academic partners include Yale University; the University of Pennsylvania’s School of Engineering and Applied Sciences; the University of California, Berkeley; the University of Michigan; The Paris Institute of Political Studies, France; Carleton College; King’s College London, United Kingdom; and Trinity College Dublin, Ireland. These partnerships involve collaborative research projects, faculty exchanges, and study-abroad programs for students. Many Ashoka students have gone on to premier global research universities such as Cambridge, Harvard, Oxford, Princeton, Stanford, and Yale and been awarded well-known international scholarships such as the Chevening, Commonwealth, Fulbright, and Rhodes scholarships. 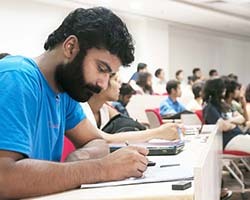 The institution’s aim is to develop a global reputation for innovative research. Included in the psychology curriculum are compulsory courses in statistics and research methods, and the school is also in the process of building labs suitable for research training in infant cognition, auditory psychophysics, and behavioral experiments. A defining feature of the program is its strong foundation in interdisciplinary critical thinking, says Annette Taylor, a visiting psychology professor at Ashoka. Courses such as Foundations of Economic Reasoning, Introduction to Mathematical Thinking, Literature and the World, Mind and Behavior, Principles of Science, and Social and Political Formations expose students to a variety of perspectives from a range of scholarly fields, she says. Chan says recruiting suitable faculty members has been challenging — partly because he and his colleagues want instructors who are not only reputable scientists but are willing to relocate to India. But Taylor says the experience at Ashoka is invaluable. “This is a fertile academic environment, which is well supported by the university, for early-career academics to build a solid foundation,” she says. For more information on Ashoka, click here.